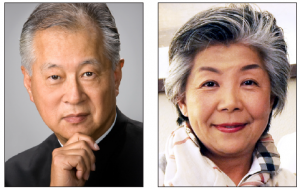 On Tuesday, May 27, the Consulate General of Japan in Los Angeles will confer the Commendation of the Consul General on Ted Tokio Tanaka and Masako Unoura-Tanaka. The commendation is conferred on individuals or organizations promoting mutual understanding and friendship between Japan and the United States, in support of the Consulate General’s mission. Ted Tokio Tanaka was born in 1942 in Tokyo and grew up in Zushi city, Kanagawa Prefecture. Due to his father’s occupation, at the age of 15, Tanaka moved with his family to Arizona. He attended a public high school and later graduated from Arizona State University with a degree in the field of architecture. After that, he moved to Venice Beach and began his career at a major architectural firm. In 1974, he established his own company, Ted Tokio Tanaka Architects. Tanaka has spent more than 40 years designing many landmarks that highlight the Los Angeles landscape. In addition, he has invested much effort in the revitalization and development of historic Little Tokyo in downtown Los Angeles. He has also served 14 years as chairman and president of the Asia America Symphony Association, where he has been a member of the board for several years. Tanaka has won many awards for the numerous landmarks he has designed, including the Los Angeles World Airport Gateway Project. As a decorated architect, he has been designated a “fellow” in design category, the most prestigious rank given to an individual by the American Institute of Architects (AIA). He was the first Japanese to receive this honor in the AIA’s Los Angeles chapter. He has also invested much in the revitalization of the Little Tokyo community through projects including the design of the Little Tokyo Metro rail station. With funding from the County of Los Angeles, Tanaka has also contributed urban designs for the Metro station’s surrounding pedestrian spaces, including sidewalk paving, street furniture and lighting. Tanaka has contributed much to the nurturing of Japanese American youth through the Asia America Symphony Association. Additionally, after the March 11, 2011 earthquake and tsunami in northeastern Japan, Tanaka’s leadership of the Asia America Symphony Association’s “Japan Relief Concert” raised $25,000, which was donated to support music programs at elementary and junior high schools in Ofunato city, Iwate Prefecture, a region devastated by the disaster. Masako Unoura-Tanaka was born in 1955 in Tokyo and grew up in Ofunato, Iwate Prefecture, and later Sendai, Miyagi Prefecture. As a high school and university student, she studied abroad in the U.S. and in the Philippines. After graduating from International Christian University in Tokyo, Unoura-Tanaka began her career in a government affiliated institution and later for a private company in Tokyo in addition to a Japanese cultural foundation in Kyoto. Years later, she was invited to Tokyo to work at the United Nations University, for a U.N. think tank to establish the “Zero Emission” Research Initiative (UNU/ZERI). She became a founding member of UNU/ZERI and for ten years, was instrumental in promoting environmental protection. Additionally, Unoura-Tanaka was invited to work for and advise the executive planning committee of the 2005 World Exposition in Aichi Prefecture. For five years, she managed the exposition’s environmental and technology policies as an environmental management producer. Unoura-Tanaka is a survivor of Japan’s greatest natural disaster. She was in Kesennuma, Miyagi Prefecture when the 3/11 tsunami struck the Tohoku region. Using her traumatic experience as a backbone, she established the Love to Nippon Project, an annual event to promote awareness of the natural disaster, as well as serve as a remembrance to all those who lost their lives or their loved ones. Unoura-Tanaka established the project in 2012 and has a clear vision to continue it for ten years. In addition to Love to Nippon and her fundraising and awareness activities for the victims of the earthquake and tsunami, she has visited the affected region numerous times to continue her volunteer efforts and help with recovery and reconstruction projects. She is also a strong advocate for reminding the world there are still people suffering from the disaster, and much remains to be done to ensure a full recovery of the region. She has also been active helping arrange visits to the Tohoku area. In 2012, she worked with the ABC7 Eyewitness News team in Los Angeles to document the continued challenges facing the devastated region. The result was an unprecedented, three-week series aired during the ABC7 newscasts. In October 2013, Unoura-Tanaka and her husband worked to bring back smiles to the affected region by organizing the “Kesen Reconstruction Efforts Golf Tournament,” a first-of-its-kind and sold-out fundraiser held in Iwate Prefecture.